You are here: Home / President's Message / Plant a Pollinator Garden – Need Seeds? Plant a Pollinator Garden – Need Seeds? Last year, President Obama directed all federal agencies to assist in pollinator conservation to protect our nation’s food security and to help keep pollinators healthy. The President’s National Pollinator Initiative is a commitment to sustaining the future of pollinators through research, policy, education, and action. As pollinators thrive and multiply, our nation will benefit. Your help is needed! Pollinators are our friends, so go forth and sow! W. Atlee Burpee & Co. donated a half a million seed packets to the National Park Service to share with school children across the country. By planting these seeds in your home or school garden, you can be a part of the international effort to keep beauty in the air and food on our tables! Share and register your garden at the Pollinator Partnership website. If you are a teacher or youth leader in the lower 48 states and would like seed packets to start your school or community garden, please email us to request a free box of seed packets. I would love to receive seeds that are bee friendly in my garden. We would love to have some seeds for our Prineville Honey Bee Haven project. Thank you! In response to questions from our members, I checked with the National Park Service & was told that the Burpee Bee Garden seed packets do NOT contain neonicotinoids or genetically modified materials. Am pleased with the president’s initiative on seed to increase pollinators. Am in kenya heading a group of about 50 begginer beekeepers. Can we access these seeds? A friend of mine had told me that bee keepers are wanted. 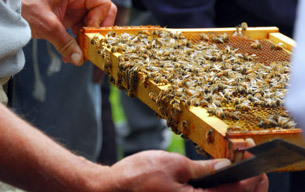 He said to check with a local Chapter about getting a hive to help in increasing the bee population. According to Derek I could get a hive and I would get a bit of the honey and the rest would be taken as a kind of exchange for keeping the bees. I may be way off but thought nothing ventured nothing gained, right :). Love to receive seeds for pollinators. I am a beekeeper. We want to thank you for connecting our association with Kass Hardy. However, after promising to send us 500 packets of pollinator seeds, she finally backtracked citing that the seeds were mearnt for Americans only. Our beekeeping project is aimed at reducing poverty and hunger among the elderly, widows, opharns $ vulnerable children, people with special needs and PLWHA here in rural Kenya. Any other good samaritan out there who wants to help? Fredrick. We want to thank you for connecting our association with Kass Hardy. However, after promising to send us 500 packets of pollinator seeds, she finally backtracked citing that the seeds were mearnt for Americans only. If I started a garden at my school, and I gave other gardens the seeds I would want to know if that is already in use?